How much do we actually need a good night’s sleep and can it really negatively affect our health if we don’t get one? The answer, simply, is yes it can. But despite being linked to poor physical and psychological health, trouble getting to sleep, remaining asleep, poor-quality sleep or waking up early are all common issues not given the same attention as being physically active or eating well. When we sleep we ideally go through a process; this shift in our consciousness from being awake to being asleep over a period of reduced activity is normally associated with lying down in a safe and comfortable environment. While there is an assumption that we are inactive when sleeping, there is plenty of research to show that it is actually one of the most important activities of the 24 hour day. Our bodies organise themselves around a 24 hour body clock, operating on a cycle of sleep and activity, a circadian rhythm. This rhythm refers to processes happening in an appropriate order, for example; growth, metabolism, adjustments to body temperature, blood pressure and heart rate. During sleep some systems such as digestion slow down, but others start to work more actively, including cellular repair, toxin clearance, memory consolidation and information processing in the brain. In short, whilst you are sleeping your body is recovering from your day and preparing you for the next. Lack of sleep can lead to low energy and has been shown to have an adverse effect on blood sugar, appetite and the immune system. It has also been linked to elevated blood pressure and research has shown there is a link between sleep and mental health, with better sleep having a positive effect on low mood and anxiety. Melatonin is a hormone that helps to regulate periods of sleep and wakefulness. It is moderated by exposure to natural daylight and increasing your exposure during the day – taking tea breaks near a window or standing outside for a few minutes – will use this naturally occurring hormone to your advantage. If you find it difficult to wake in the morning, get the curtains open to let in some natural light. Is your bathroom or bedroom lit up like a football stadium? Bright lights stimulate our brain to wake up, so start to reduce electric light about an hour before bedtime. Cleaning our teeth in a bright bathroom then expecting our brains to immediately switch off is giving a mixed message to the brain. If you have dimmer switches, use them. The bedroom should be for two main activities; sleep and intimacy, not for work, exercise or watching TV. Turn the technology off and ban it from the bedroom, the light emitted from electronic devices can suppress the secretion of melatonin and your brain needs to get used to the idea that the bedroom means sleep. If you use an alarm clock turn the face away from you and pop it just out of arms reach to reduce the temptation to keep checking the time. If it is possible, get rid of the alarm clock for one or two nights a week, this will give your body a chance to tell you how much sleep it needs. Keep the temperature of the bedroom cool, a reduction in body temperature signals the body to seek sleep. Is your mattress comfortable? Vacuuming the mattress, refreshing the pillows and bedding and choosing a detergent you like the smell of can all promote more restful sleep. On average we sleep between 5 – 10 hours a night, reassessing your sleeping environment, finding practical solutions and making some adjustments may help you sleep better. It may take a few nights to get used to the idea of a new bedtime routine, but it could make a world of difference. Start to wind down before bed with 30 to 60 minutes of reduced activity, lighting, TV and technology. You could read an easy book to relax, try relaxation techniques or visualise somewhere warm and pleasant with good memories. Experiment for a week or so with a modified bedtime routine, try different options to reduce activity and invite sleep in. Keep to a consistent schedule of going to bed and waking up at regular times. Keeping a sleep diary with notes on what you changed and how you slept may help to create an effective routine. Building a little more exercise into your day helps the body to feel physically tired. You can increase activity levels by doing housework, walking around the supermarket at a quicker pace or more vigorous activity such as running. However, avoid exercise just before bedtime as winding down is the aim. Near bedtime, try to limit things that stimulate the brain, like caffeine, nicotine, alcohol and food. Have them earlier in the day and allow the biggest time gap possible between these and bedtime. Many articles promote having no caffeine after 3pm, for some of us that is tricky, but widening the time gap between that last cup of tea or coffee and bed may be helpful. Alcohol may give us a relaxed feeling, but it inhibits our normal circadian rhythm and melatonin secretion. Indeed, alcohol acts like a sedative and leads to unrefreshing sleep, causing you to get up during the night to visit the toilet or waking up in the morning feeling sluggish or hungover. Moderate your alcohol consumption and try to allow the biggest gap possible between that last drink and bedtime. It’s no surprise that stress, low mood and anxiety may keep you awake. Worries about specific issues such as exams, interviews, family, abuse, grief or trauma can all adversely affect sleep and it is bitterly ironic that while mental health problems need sleep to improve, they can often prevent us from sleeping. 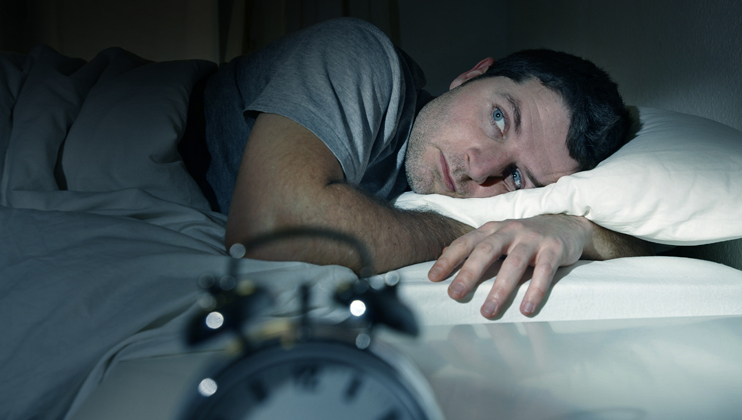 For many there may be unhelpful psychological associations with sleep too, nightmares or worry about sleep, telling yourself that you are in for a bad night’s sleep, these can be self-fulfilling and prevent you from getting the sleep you need. If you are anxious about having too much to do, try writing a list before bed. If you have recurring bad dreams or thoughts, meanwhile, try writing yourself a different ending, or write yourself to a safe place. This can help the mind to reduce the connection with these thoughts whilst you sleep. If you do wake up during the night thinking then try and get up or try and keep your eyes open, it is amazing just how difficult it is to try and keep your eyes open as your natural response is to close them. If you lay awake at night for more than about 30 minutes with thoughts racing or chasing sleep, get up. Reduce your body temperature by standing on a cold floor or placing your hands on a cold window for a while. Go to a different room and do something quiet (not TV) with as little light interference as possible. The aim is not to stimulate the brain, rather to break the cycle of thoughts and habits. Try going back to bed after a short time, it may take several attempts to get into a better habit. Ill health, pain, snoring, sleep apnoea and some medication can adversely affect sleep. Check the small print on medication for effects on sleep and speak to your GP to discuss treatment options for mental health or physical problems like restless legs syndrome or sleep apnoea. Sleeping tablets or non-prescription medication may be a short term fix to break a habit, but over a long period of time they often become less effective. It may take time to create new, healthier sleep routines and, while change can be a challenge, the physical and psychological gains from improved sleep are worth the effort. Good luck and sleep tight.